Imagine if you found out a high-standing member of your community had a secret wife. Now imagine you are an English subject and that the high-standing person is your King! This was precisely the case during the reign of George IV--though most of English society knew about the first wife of George even while he was still Prince of Wales and then Prince Regent. 1. 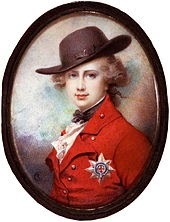 The Prince of Wales could not marry a commoner. This was law. 2. The Act of Settlement of 1701 prohibited the protestant Prince from marrying a Catholic, at cost of his title and claim to the throne. These were the legal impediments. There were also ethical and moral ones. Maria was a deeply religious woman. She would not consent to being the Prince’s mistress. He went so far as to stage a “suicide,” stabbing himself and promising to bleed to death if she did not come to him. He did this knowing all the while that a marriage to her could never be valid in the eyes of the law. 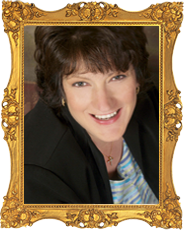 Maria consented to a wedding under duress, but then fled his attentions by fleeing to Europe. Yet the Prince hounded Maria, swearing his lifelong love and devotion to her at every turn. Sadly, George’s “undying devotion,” did not last. By 1788 he had an affair with an opera singer, and was from then on never constant. Then, at a time when the prince had fallen into deep debt (a problem that plagued him throughout his life; he was an incurable spendthrift and lover of luxuries) the King (George III) agreed to help him—if he got married. A cousin, an obscure German daughter of a duke from the house of Brunswick was chosen, and the prince, with encouragement from his latest mistress (who wished to alienate him forever from Maria) agreed to the marriage. marriage. In short, the country wanted a legal heir and was willing to pay for it. Moreover, they wanted a royal marriage that wasn't a scandal. 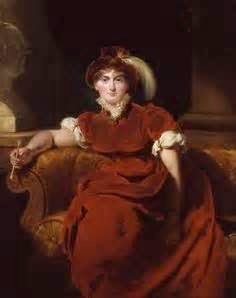 Unfortunately, the ensuing legal marriage to Caroline of Brunswick Wolfenbüttel was an unmitigated disaster. The couple spent enough time together to have one child--the popular but doomed Princess Charlotte--and then separated for good. To his credit (and there is very little to his credit regarding his marriages) George never forgot Maria. 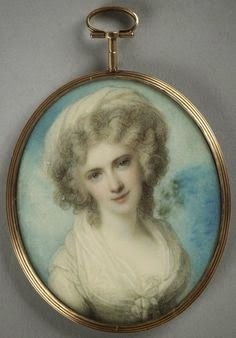 At his death, he was found wearing a miniature portrait of her around his neck, nearest his heart. He had also saved all her letters. For a good post on how George pursued Maria, see this post on "History and Other Thoughts." What would you have done if you were Maria? Would you have married the Prince, the most eligible male in the Kingdom? That's a fascinating story, Linore. What a tangled web they wove! Wow! What an incredible story. I love the Fact or Fiction approach. Fascinating post. But poor Maria! Rebecca phrased it perfectly. What a tangled web! Poor Maria, indeed! Thanks for the delightful post, Linore, it's very enlightening. I've seen Maria Fitzherbert: The Secret Wife of George IV by James Munson mentioned in the Quizzing Glass Blog, but haven't seen it reviewed.